Anti-Dog Meat Ad in China. Translates to: "Dogs are Family, not Food"
As part of Lady Freethinker’s Defeat Dog Meat campaign to save dogs and cats from the horrors of the meat trade, we have posted a new bus stop ad in China. The ad is strategically placed in the city of Shenyang’s Xita district — an area notorious for cruel dog meat restaurants, where stolen pets are thrown into cold, cramped cages, often tortured, and then brutally killed. 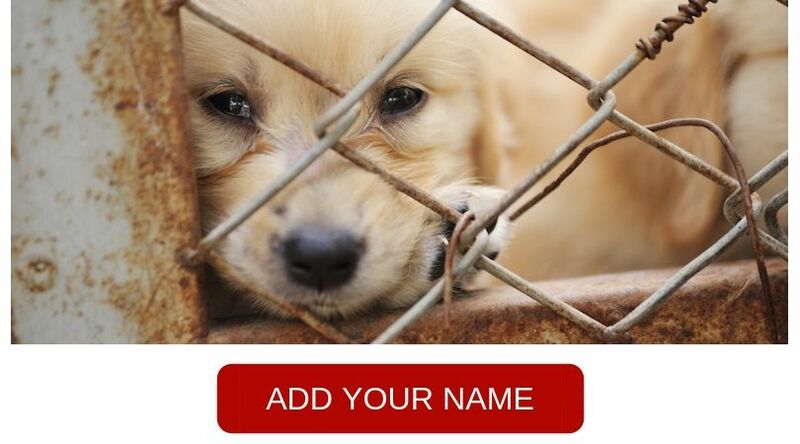 An estimated 20 million dogs and 4 million cats are slaughtered for meat each year in China. Many are pets stolen from their loving families, with collars still tied around their necks as they’re sliced open at the slaughterhouse. Others are strays shot with poison darts and grabbed from the streets by criminal gangs. The dogs are often tortured mercilessly before slaughter in the cruel belief that the adrenaline makes the meat taste better, or provides some sort of health benefits. They may be beaten, electrocuted or burned alive. Thousands of these innocent dogs die each year at the gruesome Yulin Dog Meat Festival, an annual “celebration” of the summer solstice in Yulin, China. LFT is actively fighting to shut down this barbaric event, and rescued 24 dogs from slaughter at Yulin last year. South Koreans still eat 1 million dogs a year, but we’re changing hearts and minds every single day to drive down demand. Dogs are Gods work to help people in need and to be loved. Cruelty must STOP; please do the right thing by animals. Dogs are loving, sensitive creatures and don’t deserve this kind of treatment for merely existing. There are many people in the world, myself included, that consider their dog family. Please think about what you’re doing to these fragile, trusting animals. They should know better, the philosophy of qi would support that eating fear and illness will cause fear and illness within one, and disrupt the harmony of qi and blood. It is known that happy and healthy farmed meat is healthier and tastier, not the other way around. This toxic, poisonous way of thinking demonstrates and explicit and violent imbalance within the person according to Asian medical theory. The way of Buddha and the way of Jesus and many other religious cultures do not promote violence, and are very specific as to what is food and what is not. During a time in China and Korea when people were starving they had no choice but to eat each others pets and children and other family members who starved to death as a result of war. In modern times, this is a choice and not a necessity. For people who are in need of support, the government’s of these two countries should be stepping up and doing more to help their people not resort to such horrific measures. Animals feel EVERY emotion and pain as humans. They are pure love and are here to bring us comfort and security. They DO NOT DESERVE TO BE TORTURED, BEATEN,OR HELD ALIVE OVER A FIRE BECAUSE YOU THINK THE ADRENALINE MAKES IT TASTE BETTER. I will be so so so happy when China stop this cruelty. We must continue everyday to change the mentality of people from China, and from all countries with this terrible illness. What wonderful work you are doing. Such an important message to relay. Education and knowledge sharing is vital in protecting the welfare of innocent dogs and cats. Please China lets work together and make a difference. Dogs are Family not food! Please do not kill dogs for food, these are beautiful, sensitive pets. “They are still family!” NOT FOOD…..! ALL animals are sentient beings. They are not our food! Very good start but laws in China need to be enacted and enforced. Hope these messages reach the ears and hearts of those in Yulin, China where many of the animal atrocities have been conducted. It is just heartbreaking for me to constantly read about these orientals across the asian continent who consistently torture and eat dogs, cats, donkeys, etc. It shows not only that they are uncivilized in their thinking but also lack compassion. Animals should not be eaten or tortured they have feelings and feel pain. Fabulous heading: Dogs are family, not food! Dogs and cats are family, not food. Good sign ! Go Vegan for all animals !